woooo! Thank God it is Saturday. That day of the week when you are at liberty to play Bruno Mars' lazy song.lol. Happy weekend to all the puzzles online lovers. How was your week and how is the weekend going? we are happy to be part of your first weekend in February of 2017. How time flies. With one month down, have you analysed your goals for the year to see whether you are on track or off track? remember that RESULTS IS THE NAME OF THE GAME. YOU NEED TO CHECK YOUR RESULTS OFTEN TO SEE WHETHER YOU ARE ON TRACK OR OFF TRACK, WINNING OR LOSING. LET US REMEMBER THAT FOR THE 12 MONTHS THAT MAKE UP A YEAR, ONE MONTH DOWN MEANS THAT YOU HAVE SPENT 8.33% OF THE TIME ALLOCATED FOR YOU TO ACHIEVE YOUR GOALS FOR THIS YEAR AND 33.33% OF THE TIME AVAILABLE FOR YOU TO ACHIEVE YOUR GOALS FOR THE FIRST QUARTER! This is puzzles planet and our duty is to ensure that you are not just physically fit, but also mentally fit. We are your dependable partner that will always walk with you in the IQ gym every Monday, thursday and Saturday......you can never walk alone and that is a promise. Simple right? 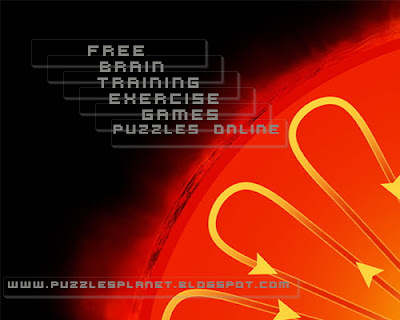 That concludes Brain Training Exercises Puzzles Online Saturday006 Series. keep your answers coming and remember to share with friends and family so that they can join in the fun......puzzlesplanet cares!